Are you looking for a new hair vitamin? I suggest you to try this one! Simply because it's easy to get here in Indonesia and the price is very affordable than most hair vitamin in the market. I just tried this Lucido-L Hair Vitamin Oil that I bought last month. 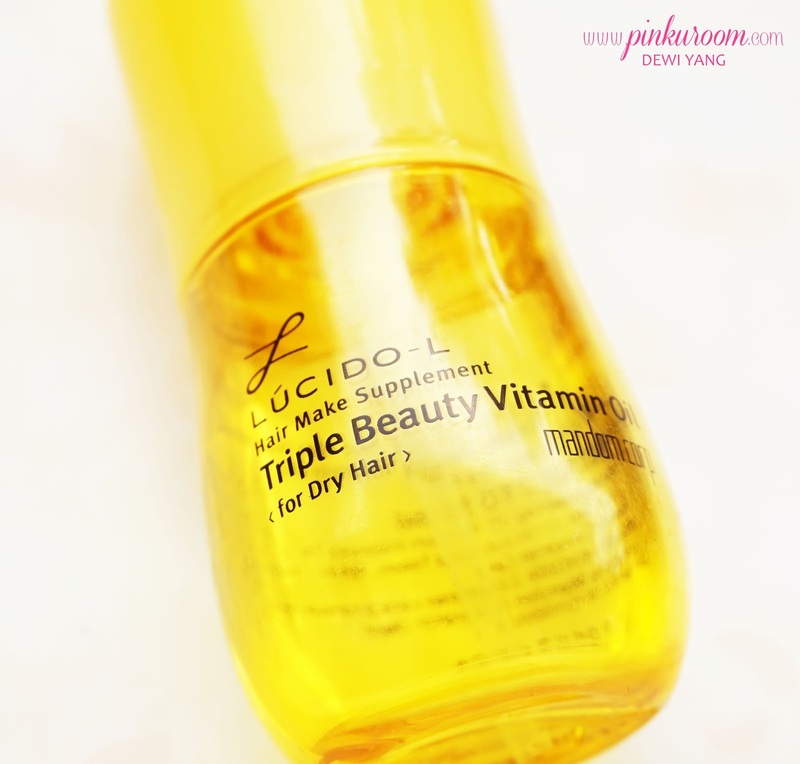 When Lucido-L first came out I buy the Triple Beauty Vitamin Hair Spray and repurchase it many times. I don't review the spray because I'm too lazy to take a picture when I purchase it and when I have time it's already used up haha. The spray is really good for before and after styling, also after you wash your hair. I already tried all three of the spray one and I run out of my L'Oreal Extraordinary Oil. 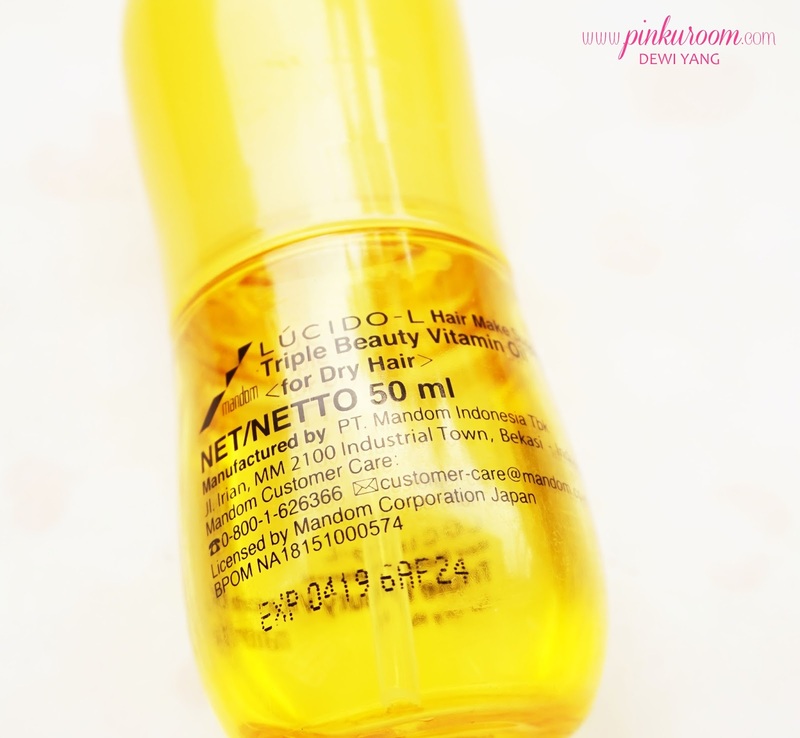 I'm looking for a hair vitamin that not too heavy big because I want to bring it in my gym bag, so I decide to try this Lucido-L Hair Vitamin Oil for Dry Hair. Actually I want to buy the orange one which is for Damaged Hair but there's only pink for Normal Hair and yellow for Dry Hair at the supermarket. I go with the yellow for Dry Hair because I bleached my hair several times, though I already cut it there's still the bleached-residue at the end part of my hair and it's very very dry! Damaged is more suitable, that's why I want the orange one *where are you orange box??*. Will make sure to buy the orange for Damaged Hair when I see it! Lucido-L Hair Vitamin Oil for Dry Hair comes in a transparent box with each color choices. 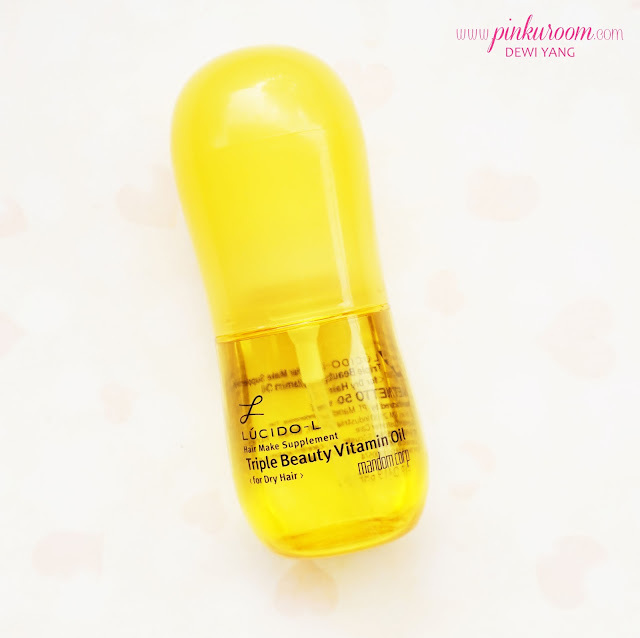 It said this hair vitamin oil contains Vitamin A, Vitamin C, Vitamin E, and Avocado Oil for shiny, smooth and moist hair. The other Lucido-L Hair Vitamin Oil also contains the three vitamins ingredients but the oil type is different. Contents 50ml for average 50 times usage. It's made in Indonesia but under Japan licensed and imported to Singapore, Malaysia and Philippines. The bottle made from plastic and comes with a pump. The size if perfect to bring while you're traveling because it's not too big and bulky. Compared to L'Oreal Extraordinary Oil packaging that made from glass, Lucido-L Hair Vitamin Oil is more travel friendly because it won't break and leak out I guess. L'Oreal also make a small size of their extraordinary hair oil but it doesn't comes with a pump so I think I won't buy it, maybe later if they are on sale haha *girls weakness: discount*. I want to try the Lucido-L Argan Rich Oil that sold in Japan. My friend use it and she said it makes her hair very soft and treat the dry ends. The price of this Lucido-L Hair Vitamin Oil is IDR 38,000 if I'm not mistaken. Good result with good price! So happy with this product~ Recommended!